Clouds are mysterious. Ceaseless shape-shifters, they are ever poised to unleash a meteorological drama (crashing opera, wispy ballet) on the vast stage of the open sky. On a hot summer’s day, these huge, slow-moving masses become a projection screen for our own emotions, memories and ideas – what if they veiled a secret life within? 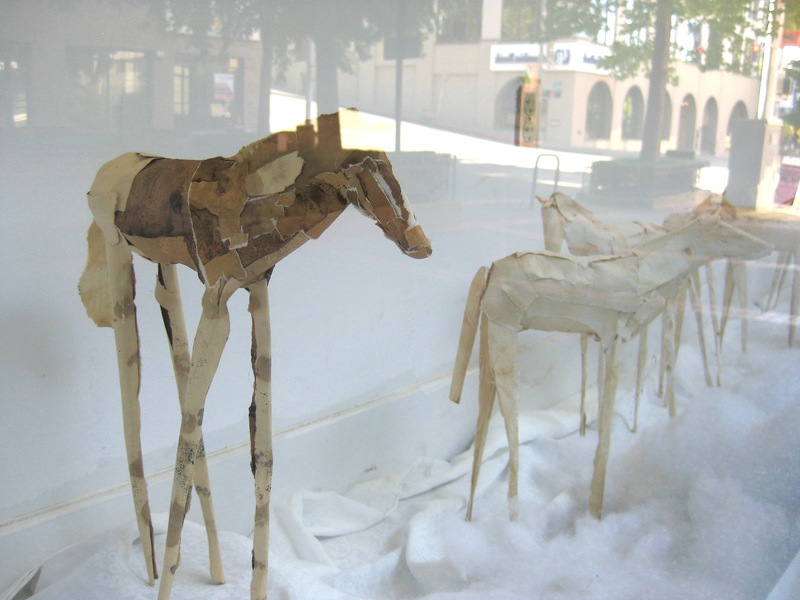 Using clouds as a backdrop, and placing horses in the foreground, artist Jennifer Adams has created a quiet meditation on the loss of a special companion in her installation, Equus Cirrus, on view at the Woolworth Building through December 15, 2012. 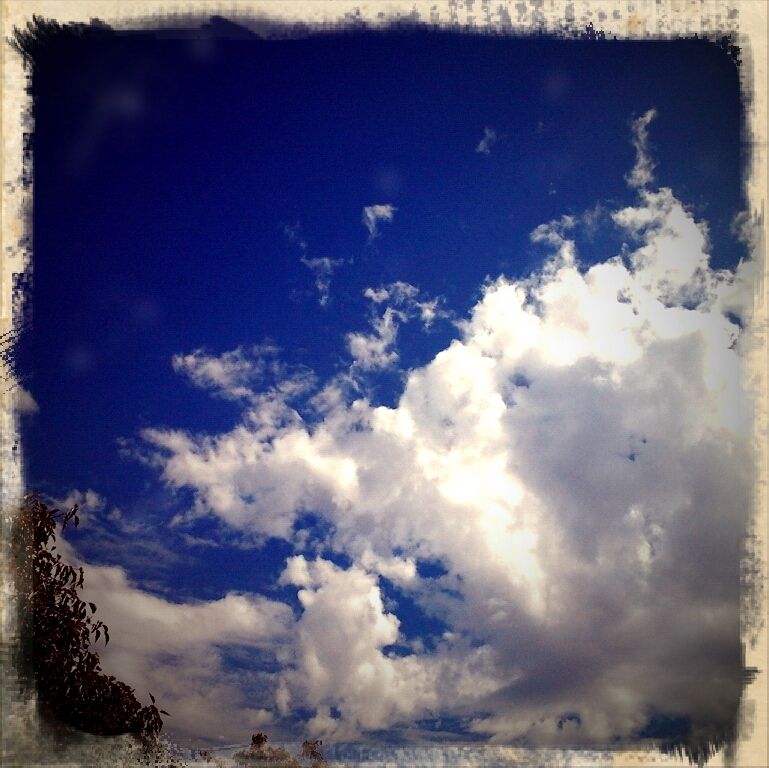 “My installation consists of horses and cloud photos. [But] what had started as a suggestion of lazy, sunshiney afternoons, had a transformation,” she says. “Recently, my beloved 13 year-old dog passed away. My thoughts were constantly about her; her life, her spirit, her energy. To try and minimize my pain, I began imagining her in the most ideal landscape, in her prime, enthusiastic and energetic. Adams’ herd of horses ranges on a field of white. “Imagining my beloved pet in this landscape led to me thinking about the spirits of animals and where they went. What would it be like if they gathered in one area? I imagined the horses, congregated in the clouds, wisps of vapor clinging to their hooves.” Adams’ comment echoes the writer Cormac McCarthy’s haunting idea that all horses have one soul. 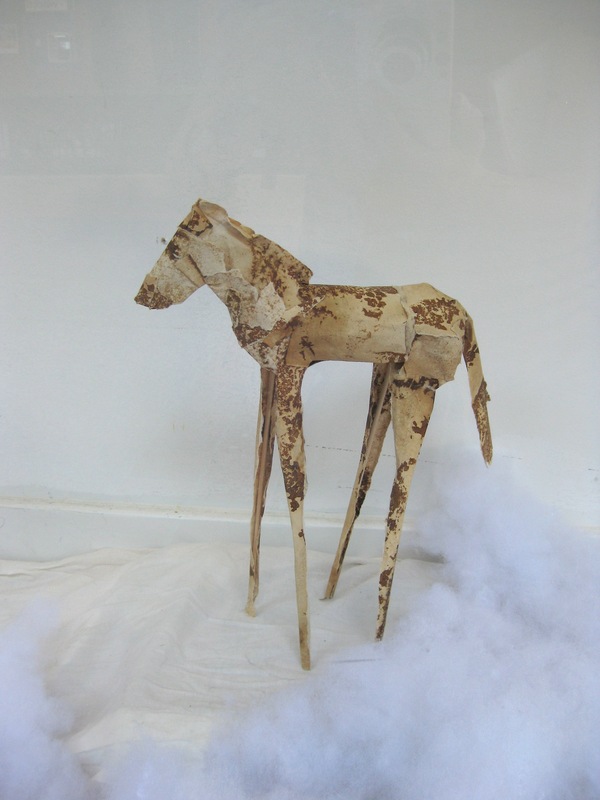 Her leggy horses, rendered in torn paper, have a beautiful, gestural quality. They are small, about 10″-14″ high, and composed in a single line across the huge backdrop of the 13′-high window. The horses stand delicately in this white cosmos; lean toward one another; sleep; there are grown horses and foals, doing what horses do, on a cloud-like range of cotton. Snapshot-size photos of clouds are suspended above their heads, also consumed by the large white space. Adams continues: “How amazing would it be to glance out an airplane window and catch a glimpse of these horses ranging about, like driving through the wilds, and encountering a herd of wild horses. Only more magical.” Equus Cirrus, the Woolworth Building, 11th & Broadway, through Dec. 15, 2012.